Located in Mimo Biscayne Boulevard Historic District, Zenmotel MIMO is within (10 km) of Shops at Midtown Miami, Port Miami, and James L. Knight Center. Jungle Island and Barry University are also within (10 km). Enjoy Night life and variety of restaurants all nearby. Zenmotel’s staff is hands on, professional and friendly. Free self-parking and free Wi-Fi in public areas are available at the smoke-free Zenmotel MIMO. 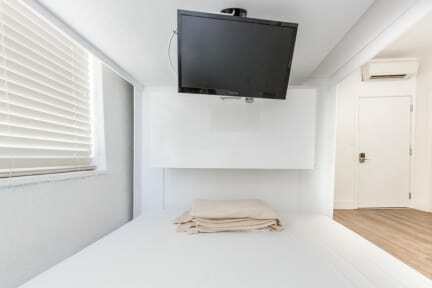 Zenmotel Mimo offers a historic setting with affordable prices in Miami. We are just minutes away from South Beach, shopping, downtown, the airport, and a whole lot more. USD 10.00 per night, per room private rooms (all including taxes). Premium Wifi, use of Zenworks facilities including printer, PC use, kitchenette, bottled water in room upon check in, Outdoor Parking (first come, first serve basis), In room fridge. Non smoking - Please note that penalties apply for smoking in rooms. Please note any refunds issued by the property can take up to 3-5 business days. Packages are accepted for a fee per package. Contact property for details. ZENMOTEL MIMO is not responsible for any lost, stolen, or damaged packages.